There is nothing special about today’s recipe except that it got a huge thumbs up from my niece, and that’s the most special thing in the world to me! I made this one pan veg noodle and manchurian stir fry yesterday because I’ve been babysitting my niece and nephew the last couple of days. I knew they’d love saucy noodles and manchurian balls. It was adorable, guys; how simply kids can pass on a compliment to you. She took one bite and asked if it was take out. When I said no, her eyes widened up and she said, “IT’S YUMMY”. That’s it. Just two words, but it was the best compliment I could’ve got. I know I’m getting all EMO here, but it’s a big deal because kids can be hard to please. And I’m not super awesome with kids usually, but getting along with these two really means alot to me. We’ve been having a blast discussing favorite cartoons, comic books, TV shows and just basically getting to know each other. And because I’ve been babysitting them, time for everything else has been cut by half. I suddenly have major respect for working mothers and how they can juggle life with kids + the rest of their life. My nephew and niece are angels so it’s easier, and I’m only looking after them this week. But having kids, spending time with them and taking care of them is a BIG deal and most of you who do this – hats off! 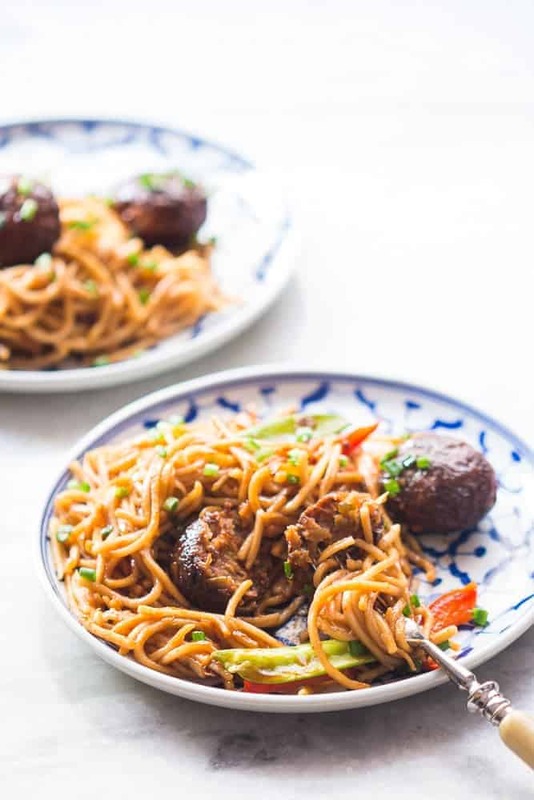 Which is also why you need this one pan vegetarian noodle and manchurian stir fry. 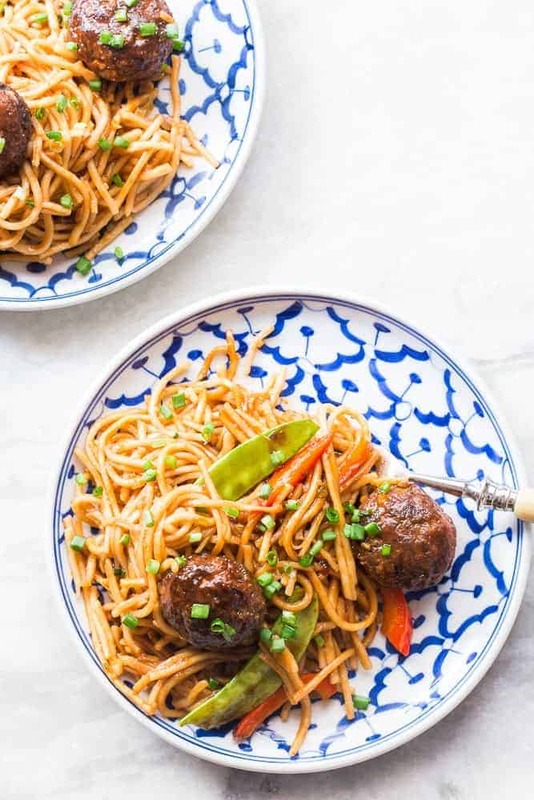 Because you get the power of saucy hakka noodles and low-fat, diet friendly manchurian balls together with half the effort! If I didn’t tell you, would you even guess that I made the manchurian balls in an appe (paniyaram) pan? It’s one of my favorite toys in the kitchen. I love it for its abilities to cut down oil and make all my fried dishes super healthy so that I can eat extras and not feel guilty. And if you still haven’t got one, I’m going to insist you get one right away! Trust me, it’ll be one of the best investments you will make. 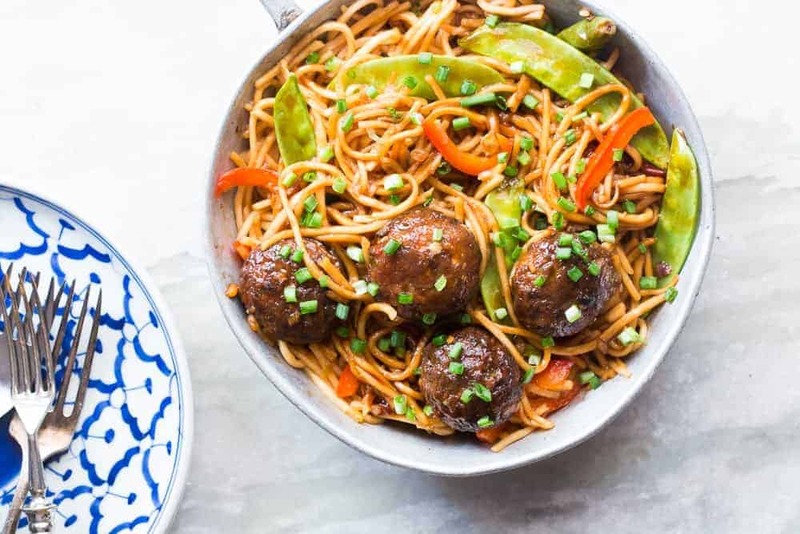 I know some of you love your manchurian with fried rice, but saucy noodles truly make this dish perfect. We’ve been eating leftovers, and there’s nothing like fighting over who gets the last noodle! If you are looking for more chinese deliciousness, follow me on Pinterest. I pin my favorite recipes everyday and we could inspire each other! 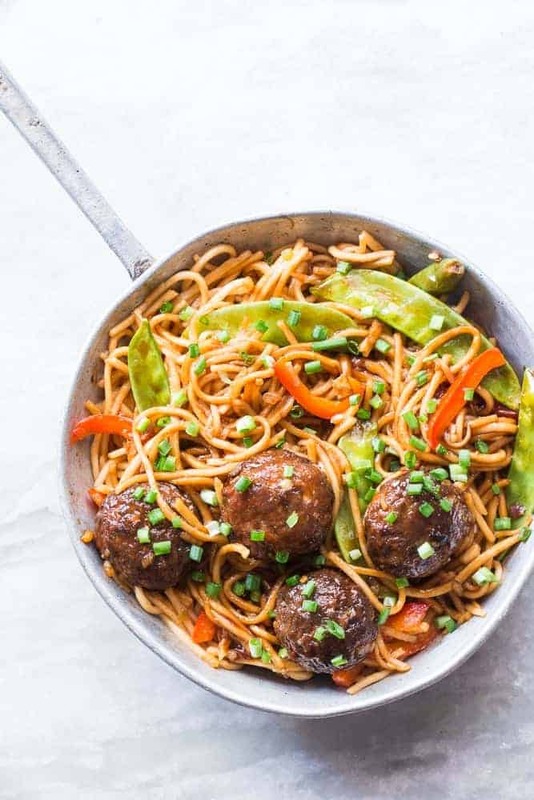 Saucy vegetarian hakka noodles and manchurian in one pan is super easy and the best indian chinese combination there is! Combine all the ingredients for manchurian except oil in a bowl. Add water little by little till the mixture comes together, but is not runny and is enough to bind the ingredients together. Heat the appe (paniyaram) pan and brush each round mould with oil. Form the manchurian batter into 10-12 lime sized balls and add them to each depression. Depending on the size of your pan, this may take 2-3 turns. Reduce the flame and cover and cook manchurian balls on slow flame for 8-10 minutes, turning them every 2 minutes. Once the balls are golden brown all over, remove and set aside. Heat oil in a large wok or kadhai and add ginger, garlic and green chili. Stir fry for 30 seconds and add the chopped white part of the green onions. Stir fry the green onions on high flame for a minute or two and add the manchurian balls. Mix together all the ingredients mentioned under sauces and add that to the pan. Lower the flame, and cover and cook for 2-3 minutes. This helps cook the manchurian balls from inside just in case they are still a bit raw. By this time, the sauces should start thickening up. Add noodles, capsicum, snow peas and cabbage to the pan. Increase the flame and stir fry for 2-3 minutes till the sauce thickens up further and coats everything. Top with chopped green onions and serve hot. What else can you substitute the Oyster sauce with? Preferably a vegetarian friendly substitution? Thanks ! Hey Aman, you can use Hoisin sauce as a substitute. You can also buy a vegetarian oyster sauce which is usually mushroom based. 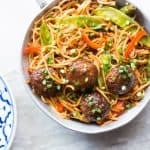 What kind of noodles do you use for this recipe? Is it just spaghetti pasta? If it is different kind of noodles where do you get them?